This was a nice start to the Festive season when we took the whole Pack, assorted Leaders and guests to see Bodicote Player’s production of their pantomime ‘Puss in Boots’, which was very entertaining and thoroughly enjoyed by all. The Cubs in particular enjoyed the audience participation and definitely seemed to be noisier and louder than anyone else in the audience! Oh yes they were! On this Thursday, we took the Cubs just up the lane from our Headquarters to Foxhall Court, which are flats for elderly people who require assisted living, where the Cubs performed a Christmas sing-a-long for the Residents of both Foxhall Court and the retirement flats of Merisham Court. This was to be the final part of the Entertainer Activity Badge which the Cubs had been working on. The Cubs looked very festive in an assorted array of Santa hats, Elf hats, Reindeer hats etc. and the Residents were in a very responsive mood, having just finished dinner, so this set the tone for a good festive atmosphere. Although the earlier practices at Headquarters were not too bad, the Cubs certainly came up trumps on the night and sang amazingly. The Residents were mesmerised and the Leaders couldn’t believe these were our Cubs! The Cubs sounded so angelic when they sang ‘Away in a Manger’ and ‘Silent Night’ that it brought tears to many eyes. Once the Cubs came to the end of their set repertoire and with the Residents asking for more, we sang some of our favourite Camp Fire songs to them. One elderly gentleman who had been a Scout many years ago led us in singing ‘Ging Gang Goolie’ and we also introduced the Residents to the ‘Ham & Eggs’ Yell. I don't think the Residents had had so much fun in ages! Once the singing was over, the staff brought out squash, biscuits and chocolates for the Cubs - and mulled wine for the Leaders. The Cubs then circulated around the room chatting to the Residents. 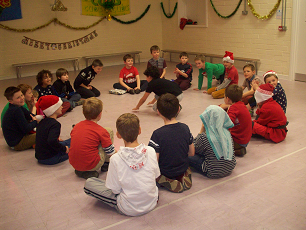 All the Residents agreed the Cubs should get their Entertainer Badge and many commented on how smart the Cubs looked and how well behaved they were, and want us to go back again in the summer and next Christmas! Our final Pack evening of the year was our Christmas Party. Festive dress, games and party food was the order of the night and as always, a good time was had by all.